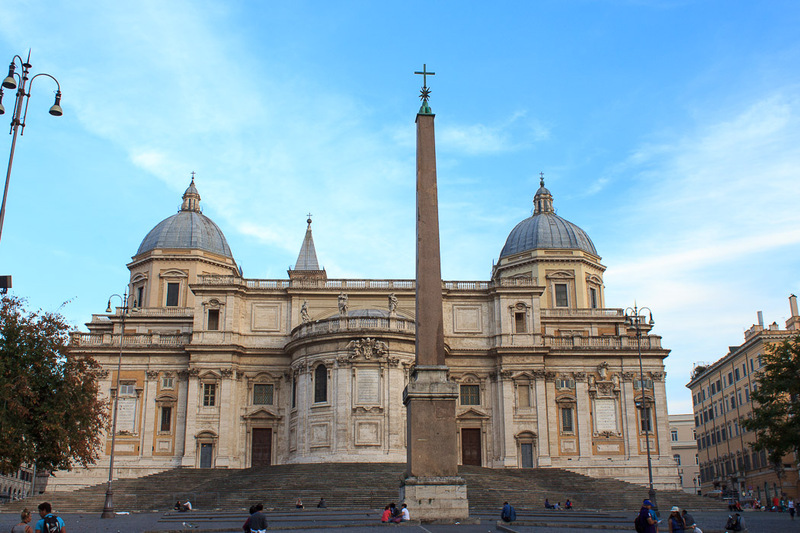 Santa Maria Maggiore is one of the four churches in Rome that is part of the Vatican, along with St. Peter's Basilica, San Giovanni in Laterano and St. Paul's Outside the Walls. It is dedicated to the Virgin Mary, and its name means that it's Rome's principal church dedicated to her. The present church was built under Pope Sixtus III (432 AD - 440 AD). The Romanesque bell tower, built between 1370 and 1378, is the highest in Rome at 246 feet. The church still has the feel of an early Christian church because of its simple basilica layout which has been well preserved through the ages. The columns on either side of the nave are made of Athenian marble. 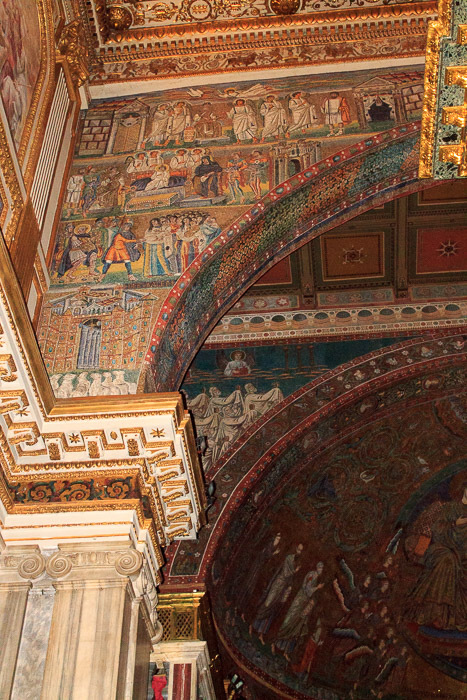 Mosaics illustrating Old Testament stories, which have been dated to 432 - 440 AD, are on the wall above them. They can be hard to see since the light is dim. The altar is topped by a beautiful baldacchino. In front of it, in the confessio is a statue of a kneeling Pope Pius IX, praying before an altar with a glass case above it. 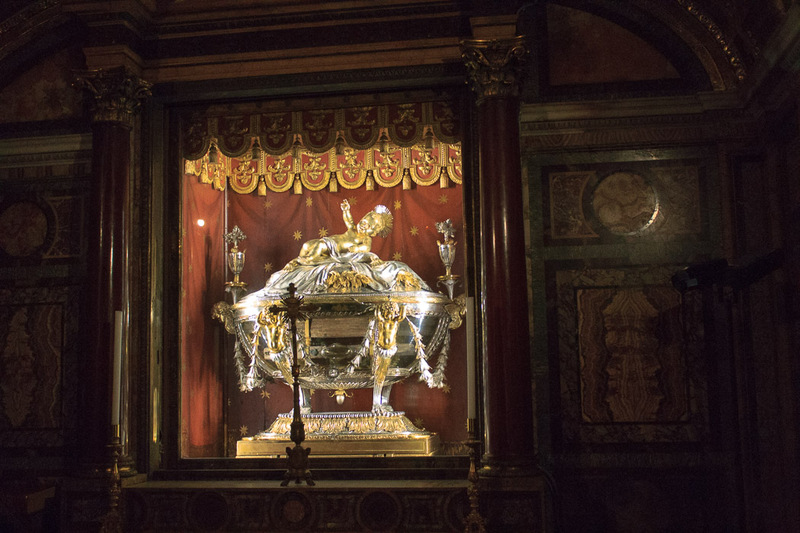 In the glass case is a silver urn which holds five pieces of wood said to be from Jesus' Manger (last photo below). To the right of the altar is the tomb of Gian Lorenzo Bernini. 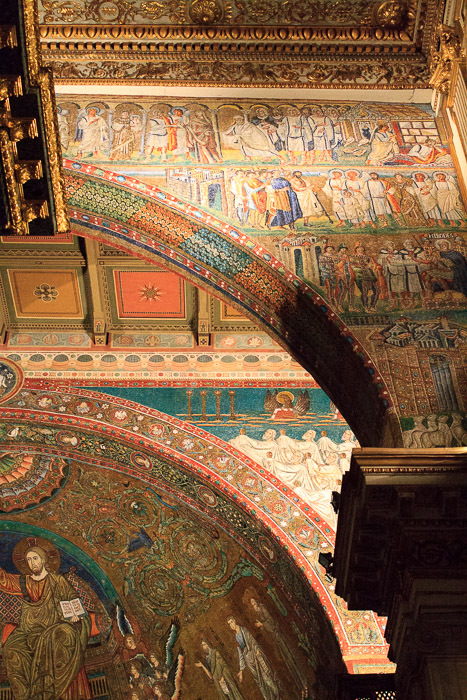 Behind the altar are three tremendous mosaics. The two in the arches were commissioned by Pope Sixtus III in the 5th century. The front arch illustrates the childhood of Christ. The rear arch illustrates the Apocalypse. 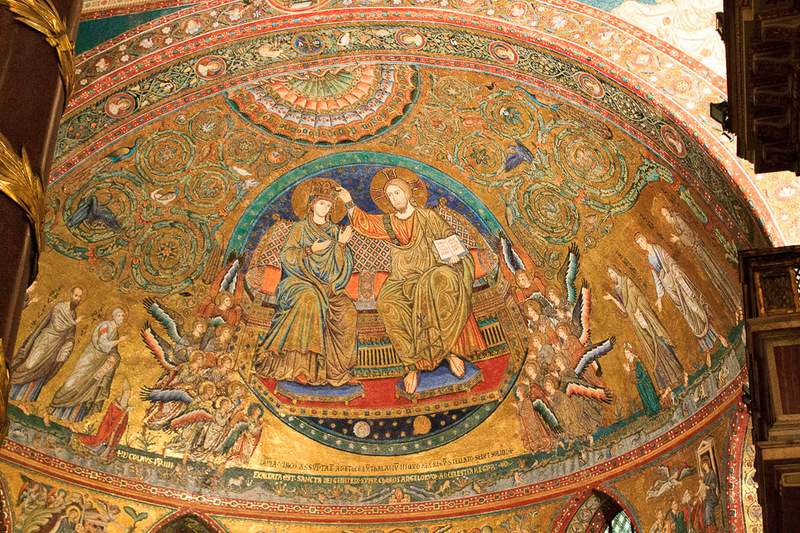 The apse mosaic, from the late 13th century, shows Mary being crowned by Jesus. To the left of the altar is the Pauline Chapel. The altar here is adorned with precious stones, and with an icon of Mary which is at least 1000 years old. To the right of the main altar is the chapel of Sixtus V, which houses his tomb. Outside in the front of the church is Piazza Santa Maria Maggiore, with the Column of Peace and the Fountain of Santa Maria Maggiore. Behind the church, on Via Cavour, is the Piazza dell'Esquilino, with the Esquiline Obelisk in it. 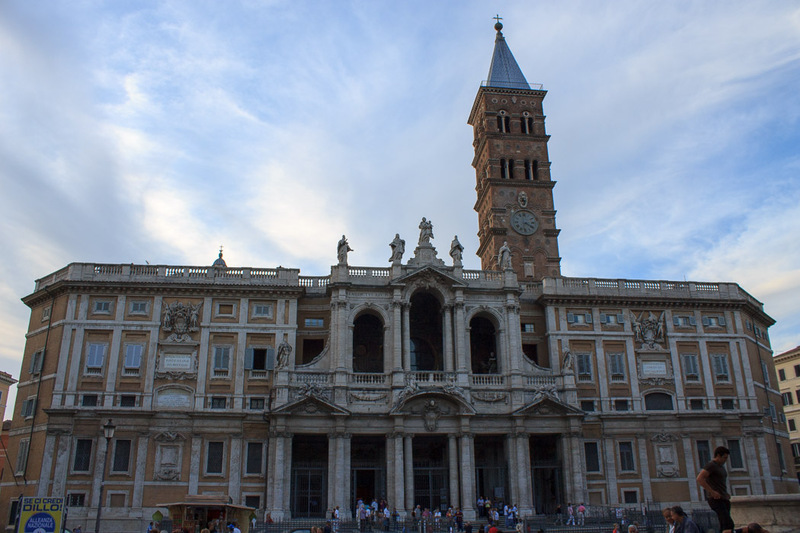 See all Santa Maria Maggiore photos.